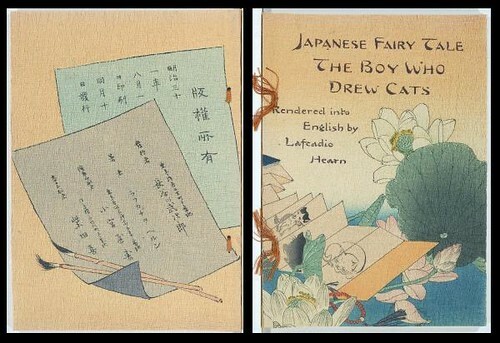 Published by Takezirou Hasegawa in 1926. 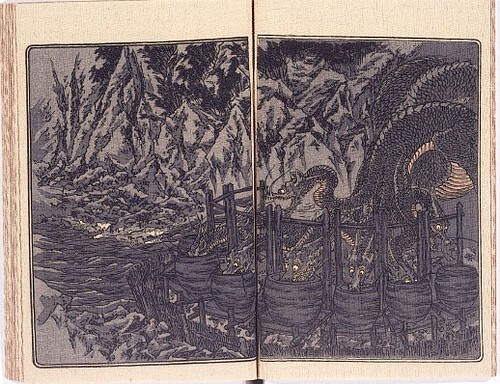 Published by Takezirou Hasegawa in 1925. 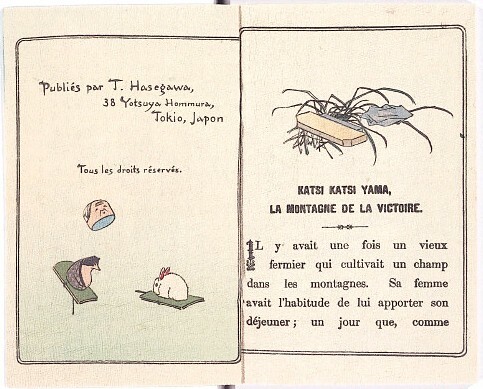 Published by Takezirou Hasegawa (undated). 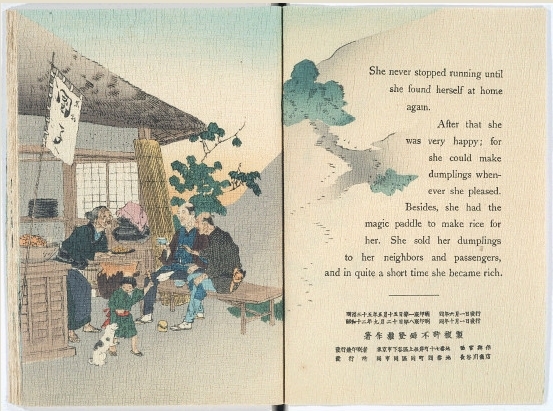 Published by Takezirou Hasegawa in 1885. 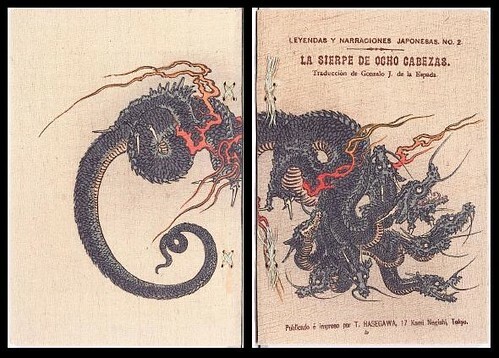 Published by Takezirou Hasegawa in 1914. 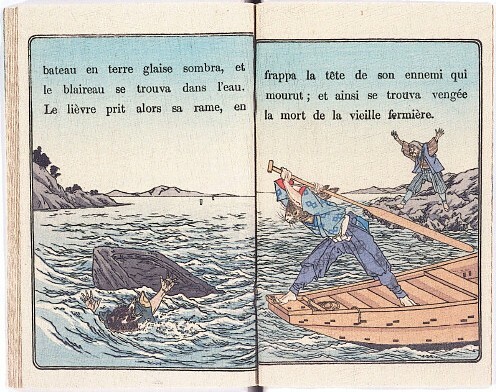 Published by Takezirou Hasegawa in 1897. 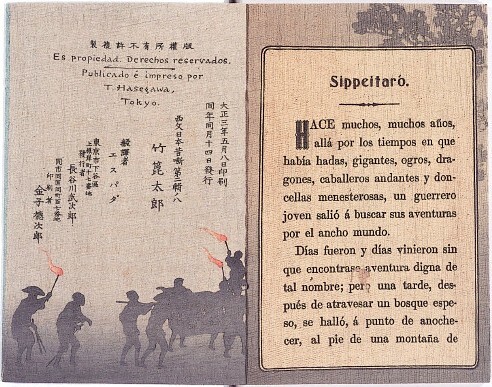 Published by Takezirou Hasegawa in 1886. 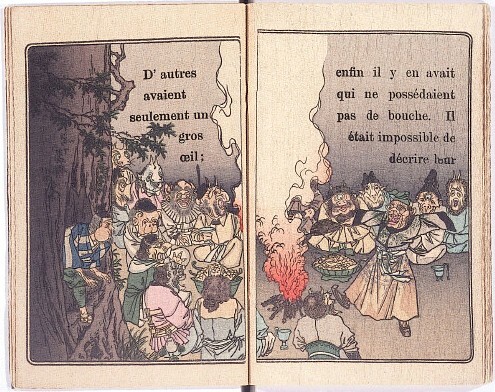 Published by Takezirou Hasegawa in 1898. 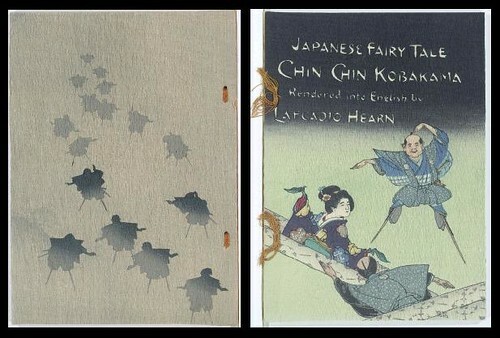 Published by Yosaku Nishinomiya Tanigawa Takeshi Stores in 1937. 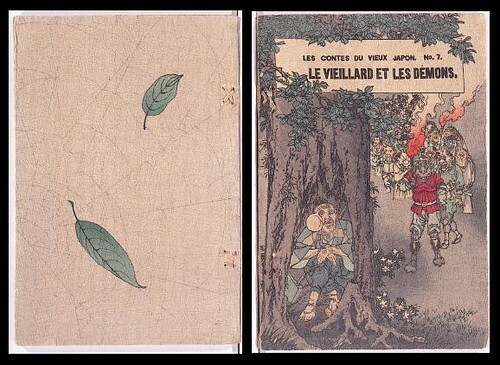 The Baika Women's University Collection of Crêpe Paper Books in Japan consists of more than one hundred and fifty works produced between about 1880 and 1940 in English, Spanish, French, German and Portuguese editions. 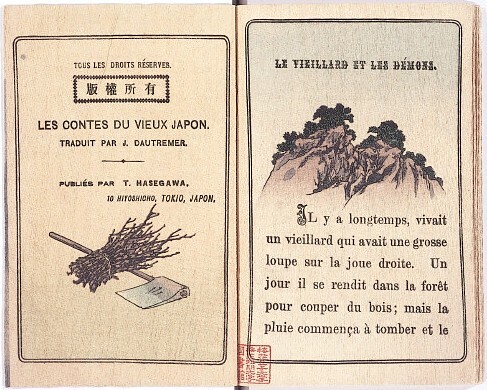 Not all of the books are present in each language and some of the books were published on thick Japanese paper rather than crêpe paper. 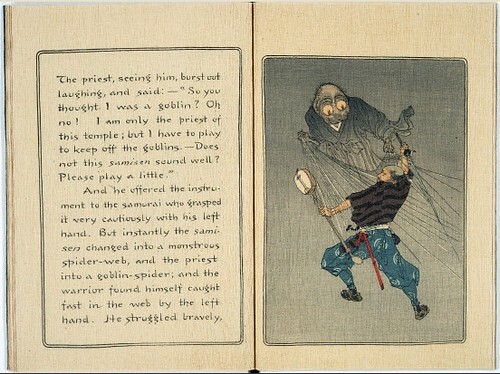 Most, but not all, of the books are traditional fairy tales. 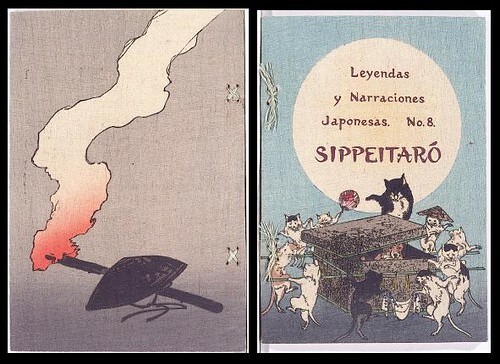 The semi-flash site is fairly slick and very easy to negotiate and includes a preface and an introduction in english. That's the good news. The unfortunate part is that the image sizes are rather small. Normally I would have bypassed this material but it's unique and exquisite and worth posting despite the down side in my opinion. 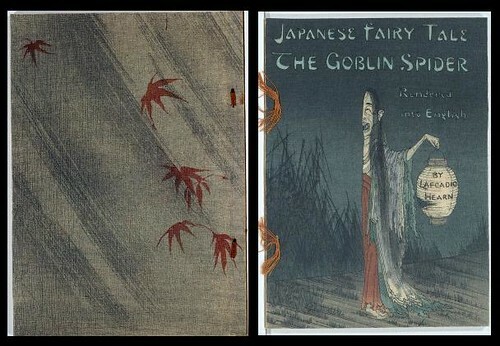 In most cases, slightly larger versions of the above images can be found by clicking through to the flickr page and clicking 'All Sizes'. In a few cases, what you see above is the full size image -- they are all screen captures. I've posted about sixty images all told to this flickr set in any event. I haven't actually looked all the way through the site yet. Alternatively, larger image versions of many (?) of the books are available in non-flash format at the International Research Center for Japanese Studies - Nichibunken - but I think the image quality is poor. 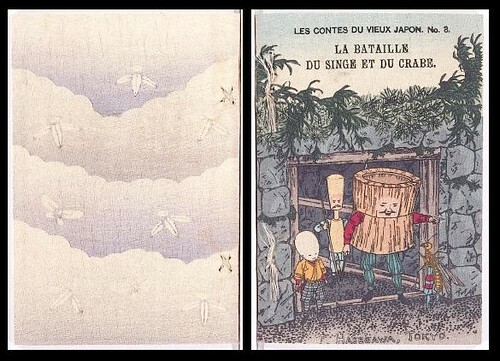 "The crêpe-paper books in this collection were published mainly in the Meiji era by Hasegawa Kobunsha. 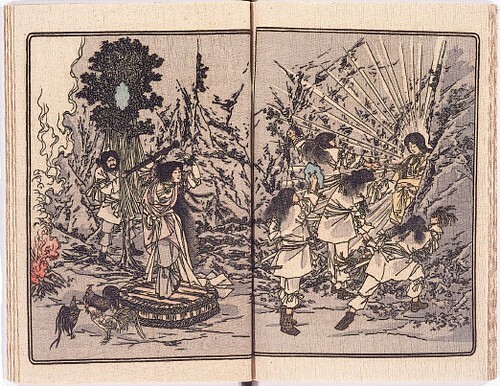 Each picture drawn by the artist was cut on a woodcut, one woodcut for each color used in the picture. 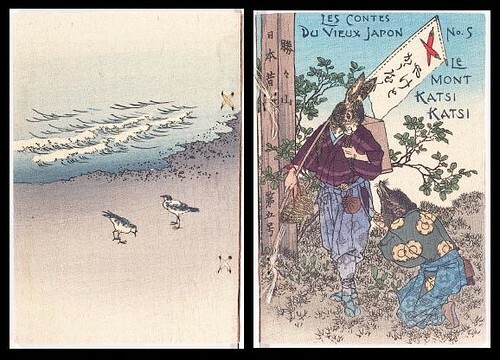 The printer applied the color to the woodcut, making a print on Japanese paper each time a different color was added. 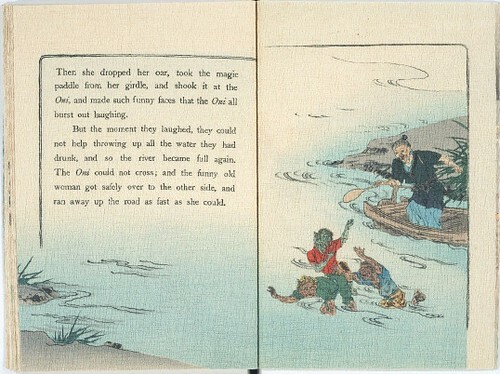 As to the story, each word was set in type, or, in some cases, in handcarved letters. 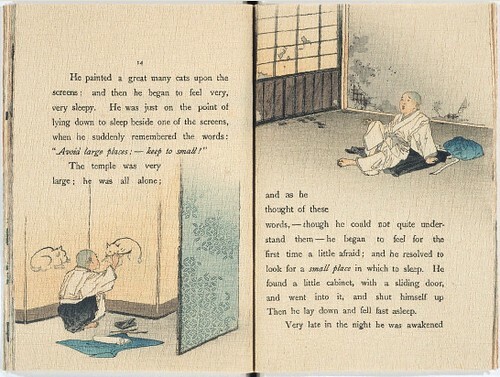 Lightly moistened Japanese paper was wrapped around a vertical cylindrical form and crinkled by pressing the paper down to the bottom of the cylinder. The crinkled paper was removed, opened, and wrapped around the cylinder again in a different direction. This was repeated eight or ten times. 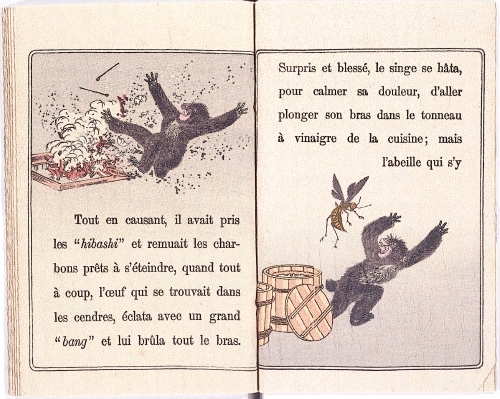 By this laborious method, soft, crêpe-like paper was finally produced. 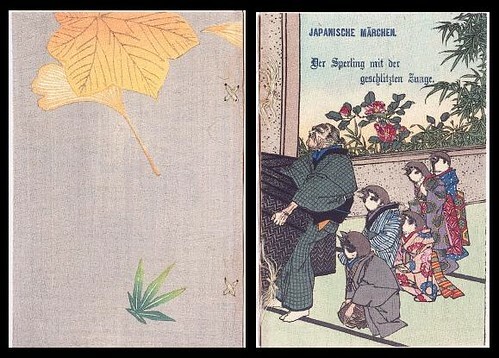 In the process, the size of the Japanese paper was reduced to about 80%. 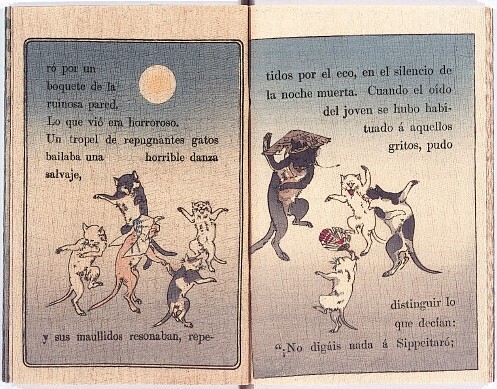 The pages were assembled and bound with silk thread." 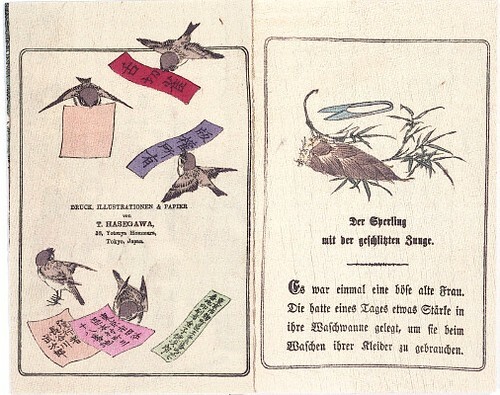 "Formerly, crêpe-paper books were largely thought of as a souvenir for foreigners to take home, but this is a mistaken idea. 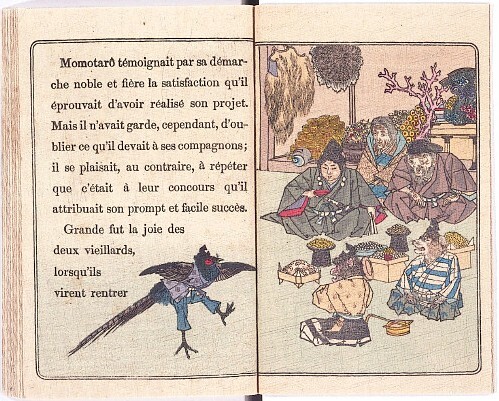 [...] Through such books, Japanese culture could be spread abroad and appreciated." What a delightful surprise. I followed the link to the Baika Women's University site and read some of the stories. 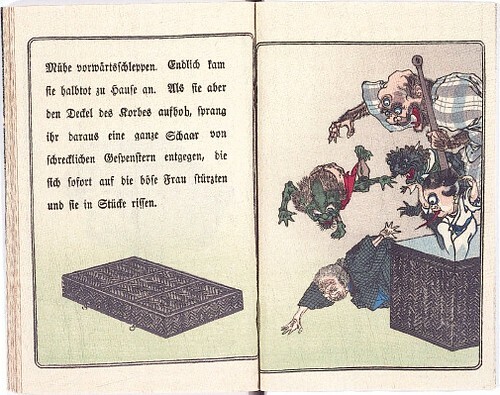 The way that text and images are pus together is its own work of art. Quite unlike some contemporary books that use all the available bells and whistles, yet make an unpleasant experience for the reader. Thand you. Gosh these are very stunning and beautiful! many thanks for sharing! Those are indeed delightful. 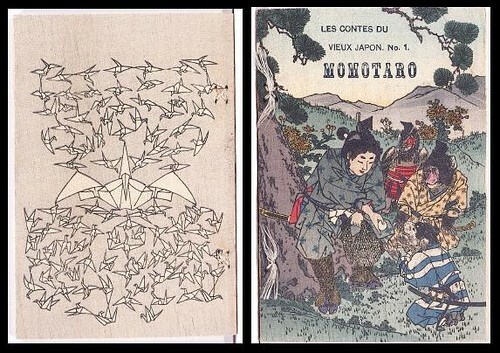 Though the books themselves are new to me (whatever you may think, I was not around in the 19th century), they bring back fond memories of reading Lafcadio Hearn and of Momotaro, and they make me want to go find a copy of Mont Katsi Katsi with the handsome hare. anyway, thanks for this, and i'll keep you posted. 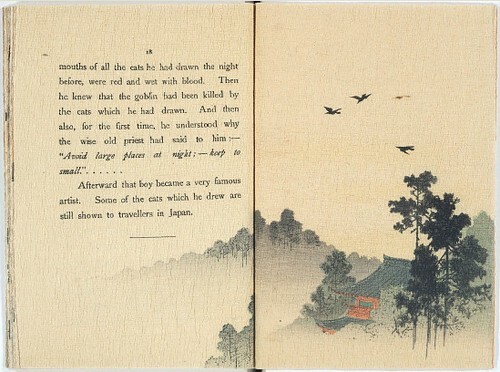 The Peabody Essex Museum in Salem, MA published a lovely catalog, Takejiro Hasegawa: Meiji Japan's Preeminent Publisher of Wood-Block-Illustrated Crepe-Paper Books, in 1994 with a text by Frederic A. Scharf. 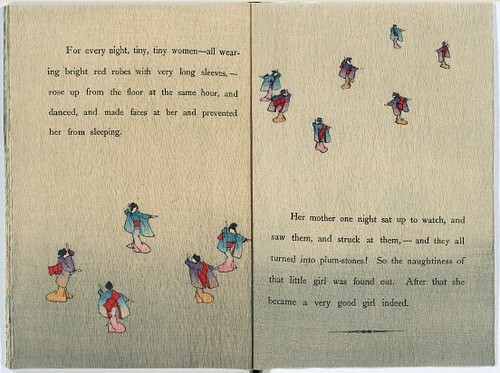 I have 3 of the crepe paper fairy tales: the Old Woman Who Lost Her Dumpling; The Fountain of Youth and the Boy Who Drew Cats. How do I find out the publishing date? They are all in great condition. 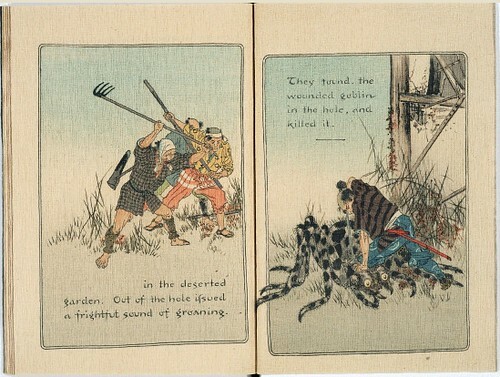 I have found pictures of them on another website. Any information on what I have? 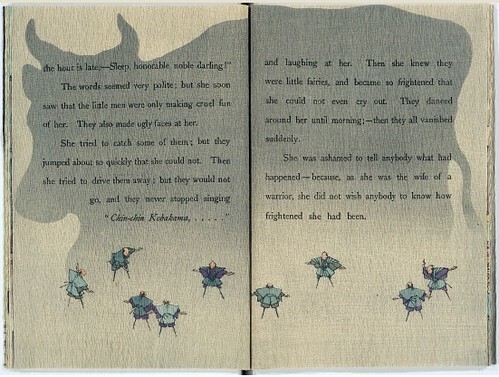 Before my grandmother passed away I stated all i wanted to remeber her by were these books. She gave them to me in a box. I have 20 numbered 1-20 series one. I have no wish to sell them as they are buetiful but would like to know there monetary value for insurance purposes. They have differing typesets and coloured titles so i know some are older than others. 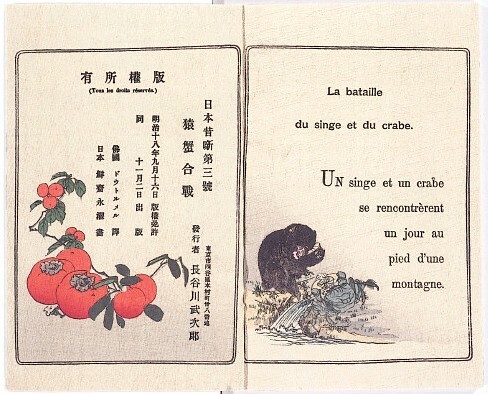 Titles are Momotaro ,the tongue cut sparrow,battle of the monkey and the crab,Kachi kachi mountain,the mouses wedding, the old man and the devils,urashima,the serpant with eighht heads(this looks the oldest in mostly black and white,the matsuyama mirror,the hare of inabi,the cubs triumph,the silly jelly fish,the princes fire-flash and fire-fade,my lord bag o rice, the wonderful tea kettle,scippeitaro,the ogres arm, the ogres of oyeyama,the enchanted waterfall. All are as new as have been kept boxed out of the light and their colours are breathtaking. Patricia & Roland I'm afraid I have no further information to share beyond the links in the post. 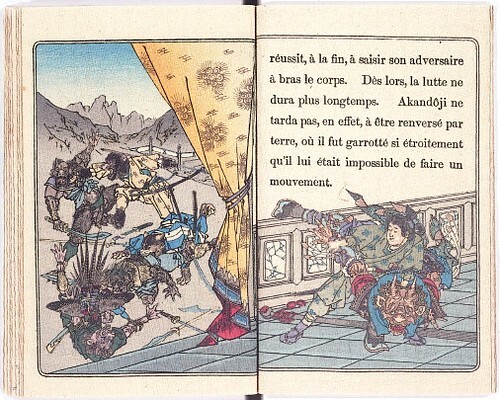 I would suggest Roland that you get in contact with a rare book dealer in your area to find out how to get them appraised. 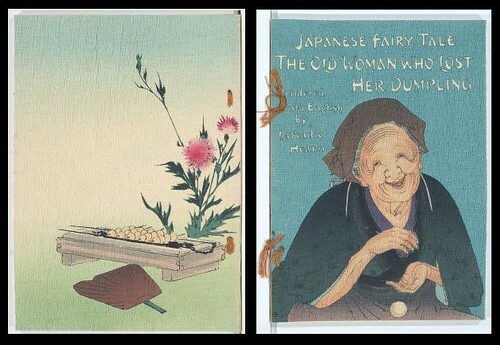 What a wonderful collection to have as a memorial of your grandmother! Thanks for sharing. Wonderful site! I have some of these works in my own private collection, hence, reading what you have on-line has been a real boon to my understanding of the art-form.